Client Protection Certification from Smart Campaign. 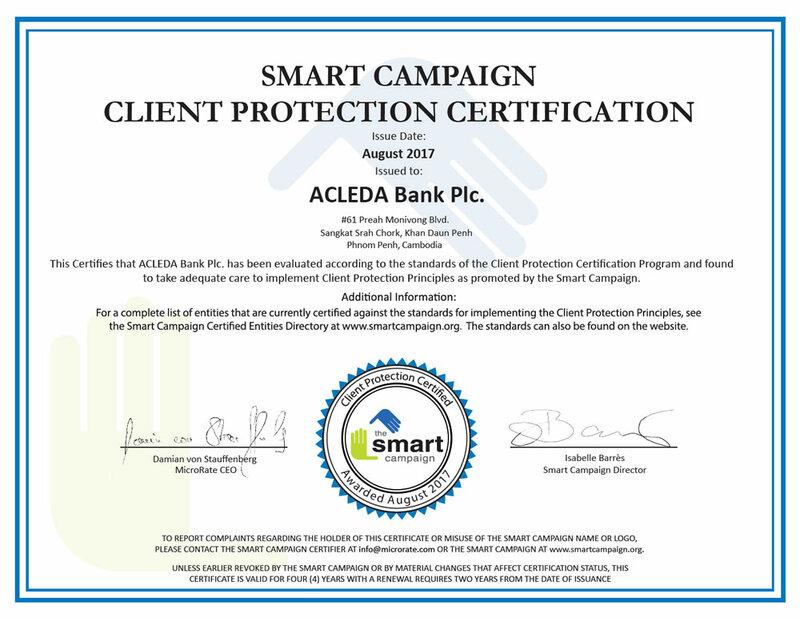 Phnom Penh - CAMBODIA – The Smart Campaign, a global initiative to incorporate strong client-protection practices into the microfinance industry has publicly recognized ACLEDA Bank Plc. as Client Protection Certified for meeting strong standards of client care. The institution joins 18 others MFI Banks from Latin America, Eastern Europe and South Asia that have been certified since the program was launched in January 2013. ACLEDA Bank Plc. has served the region for 24 years and currently serves over two million smart customers. "We extend our heartfelt congratulations to ACLEDA Bank Plc.," said Isabelle Barrès, Director of the Smart Campaign. "Their willingness to do the work it takes to prepare for and undergo the intensive process of evaluation is indicative of their deep commitment to their clients. They have shown that this bar is achievable in the area of client protection. Their example will catalyze a movement towards certification within the broader industry." The Smart Campaign's Client Protection Certification program publicly recognizes those institutions providing financial services to low-income households whose standards of care uphold the Smart Campaign's seven Client Protection Principles. These principles cover such important areas such as pricing, transparency, fair and respectful treatment and prevention of over-indebtedness. "We have always held a strong commitment to protecting our clients, but this independent validation lends credibility and demonstrates to our community and our industry that we continue to work every day to improve our service and our commitment to best practices in financial services." said Dr. IN Channy, President & Group Managing Director of ACLEDA Bank Plc. ACLEDA Bank Plc. 's customers have been well aware of and received the detailed information about the pricing and fees of the Bank's financial products or services displayed at all branch and office networks before they make decision using certain financial products or services. Before lending, the Bank always studies on customers' business, their cash flows, and check the customers' credit information with Cambodia Credit Bureau to avoid repeated loans and/ or over indebtedness. The Bank also has 24/7 call center standby in responding to all customers' general inquiries. Furthermore, the Bank has set up multi-channels of choice to handle customers' complaints in addition to the 24/7 Call Center, such as by email, complaint boxes at all branch and offices. Our officers have strong commitment to address customers' complaints and concerns at spot and within the same day. 1- A successful client who lives in a remote village in a South-Western province of Cambodia namely Koh Kong, skilled artisans make rattan furniture. Every day, dozens of visitors, and her customers purchase furnitures from handicraft community – especially from Noeum Aun, a 61-year old woman micro business owner with the support of her husband and children, she makes and sells rattan furnitures at her shop house. Initially Mrs. Aun's business has grown slowly, and the business started to pick up after she has obtained micro business loan of KHR 1,500,000 equivalent to US$370 from ACLEDA Bank 2011 for raw material, the rattan, and she has obtained subsequent loans of 5 cycles including the loan of US$11,000 in 2014 for her business expansion. With the Bank's guidance as well as financial facility, her business has flourished and her living conditions have improved resulting in building new house and purchasing new van to supply the furniture to Phnom Penh, the capital city of Cambodia. 2- Along Mekong river, Wat Chas Village in Preaek Dambang Commune, Mukh Kampul District, Kandal Province, is one among famous weaving villages. Li Sophea, a 50-year old woman, is a scarf weaver with the support from her husband, Pum Sipha, and two children. Sophea's success came slowly before receiving a micro loan of KHR 4,000,000 from ACLEDA Bank in 2013. After purchasing raw material (thread) and learning weaving business, she took following steps by applying for and received ACLEDA Bank loans to purchase more thread. With the Bank's guidance as well as its money, her business has flourished, and her living conditions have improved and resulting in being able to make home improvement and buy new agricultural equipment and machine for farming. 3- Along Mekong river, La Edth Village in Preaek Dambang Commune, Mukh Kampul District, Kandal Province, is one among famous weaving villages. Phon Ny, a 51-year old woman, is a scarf weaver with the support from her husband, Ath Chamnan. She received a micro loan of US$ 2,500 from ACLEDA Bank in 2012 to purchase raw materials. After expansion of her business and seeing this success, she took further steps by applying for and received ACLEDA Bank loans as follows. With the Bank's guidance as well as its money, her business has flourished, and her living conditions have improved resulting in being able to set up new outlet near the riverside. 4- Along Mekong river, Kbal Kaoh Village in Kaoh Dach, Phnom Penh, is the most famous silk village. Dos Hong, a 63-year old woman, is a silk weaver with the support from her husband, Doeun Phal, and a daughter. Before receiving a micro loan of US$ 1,600 from ACLEDA Bank in 2013, Hong's micro business grew slightly. After purchasing raw silk, she took following steps by applying for and receiving an ACLEDA Bank loans to purchase more raw silk. With the Bank's guidance as well as its money, her business has flourished, and her living conditions have improved resulting in being able to buy new agricultural equipment and machine for farming. The certification program contains a rigorous set of standards against which institutions are evaluated by independent, third-party raters that are licensed by the Smart Campaign. The raters – M-CRIL, MicroFinanza Rating and MicroRate – are established, specialized microfinance rating agencies with extensive experience, having analyzed hundreds of institutions to date. "Microfinance emerged in the wake of inability of the formal sector banks to be client-centric and reach the excluded sections of the society. As such, it is important that the focus of micro finance remains on clients. Initiatives like Client Protection Certification ensure that this focus is not diluted," said Dr. Alok Misra, CEO of M-CRIL, one of the licensed rating agencies. ACLEDA Bank Plc. has long demonstrated a commitment to client protection. Prior to undergoing certification, the institution was evaluated by the Smart Campaign on their practices, and contributed to the development of Campaign tools to help advance the sector. "As this program grows, we envision the Client Protection Certification becoming a widely-recognized, distinguishing mark, like Fair Trade, that signals to clients, investors, internal stakeholders and the general public that its bearer upholds strong client protection principles," says Elisabeth Rhyne, Managing Director of the Center for Financial Inclusion at Accion where the Smart Campaign's secretariat is housed. Currently, ACLEDA Bank Plc. has 5 subsidiaries including ACLEDA Bank Lao Ltd., ACLEDA Securities Plc., ACLEDA Institute of Business, ACLEDA MFI Myanmar Co., Ltd. and ACLEDA Properties Ltd., and the Bank also has its representative office in Myanmar. By the end of July, 2017, ACLEDA Bank Plc. has total assets of US$ 5.25 billion, loan outstanding US$ 2.96 billion, and deposit US$ 3.375 billion. The Smart Campaign aims to improve client protection in microfinance through better understanding and use of client protection principles by microfinance institutions (MFIs). Certification of MFIs is one of the primary activities of the Campaign. The Client Protection Certification Program is possible because of partnerships with the MasterCard Foundation, Ford Foundation, the International Finance Corporation, the Multilateral Investment Fund a (member of the IDB group) and microfinance pioneer Accion. It has been shaped through cooperation with dozens of supporting organizations, notably the Smart Campaign's co-founder, the Consultative Group to Assist the Poor (CGAP). For further information, visit www.smartcampaign.org. ACLEDA Bank Plc. Obtained the Achievement Award from Credit Bureau (Cambodia) Co., Ltd.